One of KidTown Melbourne's favourite family friendly circus shows Silvers Circus is on the move again, and you can win tickets to see it. 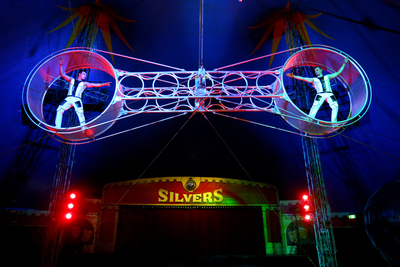 Silvers Circus has been entertaining Australian families for just over 40 years. That said, no two visits to a Silver Circus are the same, as Australia's premiere circus is constantly evolving and changing acts. Silvers Circus invites performing artists from all over the world to join the touring show. Right now, the spectacular line up includes; the Wheel of Steel, the Globe of Death, Hula Hoops (up to 80 at once! ), good ol' fashioned (but funny) Clowning, the Roman Rings and a mesmerising Illusionist, just to name a few. Silvers Circus is an action packed 2-hour show, offering a nostalgic Big Top circus experience, performed in your neighbourhood! KidTown Melbourne is excited to announce that we have a family pass* to give away to THREE lucky families to a show of your choice. A family pass is 4 tickets (2 adult and 2 children) and valued at $140. To enter, we would ask you to message us on kidtownmelbourne@gmail.com with SILVERS CIRCUS 2017 as the email title, and tell us why you would like to win this amazing prize. Winners will get to choose their preferred time and venue, depending on availability. Three winners will be picked by 5pm AEST on Friday 10 February, 2017.